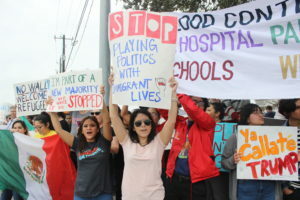 McAllen — Hundreds of protestors and an almost equal amount of supporters lined the roadway leading to McAllen-Miller International Airport Thursday as Air Force One carrying President Donald Trump, his staff and the White House traveling press corps landed on the tarmac at precisely 12:50 p.m. Thursday afternoon. The President visited the U.S. Border Patrol McAllen Station where he participated in a round table discussion on immigration and border security, as well as Alzadua Park, a natural 96-acre county-owned park along the Rio Grande River known for its rich bird life and which is expected to be severely impacted should the government follow through on construction of the border wall championed by the Trump administration. Trump’s arrival comes after a government shutdown entered its third week. The shutdown stems from a disagreement between the Republicans and Democrats on funding for Trump’s proposed border wall. Trump has said that he will veto any bill that does not include an estimated $5.7 billion for the wall, though Democrats remain staunchly opposed to wall funding. According to reports, 800,000 federal employees have been furloughed or are working without pay and won’t receive their next paychecks until the government reopens. 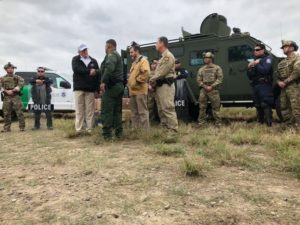 During a televised address to the nation on Tuesday night (Jan. 9), the President urged the public to support further border security through building a wall. “America proudly welcomes millions of lawful immigrants who enrich our society and contribute to our nation. But, all Americans are hurt by uncontrolled illegal migration,” the President said during his televised address. He argued that illegal immigration places a strain on jobs, wages, and resources. 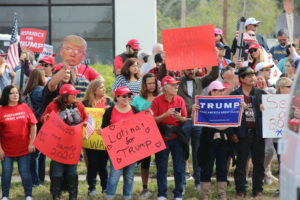 Trump’s arrival was met with a myriad of supporters and protesters, both groups gathered outside of La Plaza Mall close to the airport hours prior to the President’s arrival. Donna resident Rosario Zavala described illegal immigration as her top issue. Zavala was one of many supporters on Trump’s side, while the other side across the street hosted an equal and opposite reaction. According to FBI statistics, McAllen ranks seventh among safest US cities, a point McAllen’s historic El Rey Theater, located in downtown McAllen, literally spelled out on its outside marque. Trump departed from McAllen for Washington D.C. at around 4 p.m.